New Zealand is facing a housing crisis. Namely, there is a shortage of reasonably priced houses for the population. Luckily, modern building methods such as 3D printing and pre-fabricated construction mean that we are now able to build homes much more quickly and at a fraction of the cost of traditional methods. However, as we live in an age where there is an abundance of harmful chemicals coupled with the fact that modern homes are now so much more airtight, could it be that, ironically, we are exposing ourselves to harm from poor air circulation? According to an article worryingly titled New build homes face emerging ventilation crisis, modern homes, although better built and more airtight may have poorer air quality because developers are simply not that concerned with improving ventilation. So what is the possible harm of having an airtight home with poor ventilation? Modern homes and furniture are built using a vast array of different materials, some of which contain VOCs (Volatile organic compounds) which are contributors to poor health. They are associated with eye, nose and throat irritation and a host of other health issues. VOCs are also present in many everyday products such as shampoo, laundry detergent and air fresheners. As good ventilation is key to reducing VOC levels indoors, homeowners will have prolonged exposure to the VOCs. If a home has high levels of condensation, it’s not only uncomfortable and damaging to windows and furniture, it could be unhealthy. Mould thrives in moist conditions and fungi can be detrimental to health, especially for those who suffer from asthma. A good home ventilation system reduces condensation in your home, meaning there is much less chance of damage to your property and a much more pleasant living environment. It prevents the build-up of fungus and eradicates unpleasant odours which can get trapped without proper ventilation. For those who live with stubborn smokers who insist on smoking indoors, a home ventilation system is a must. 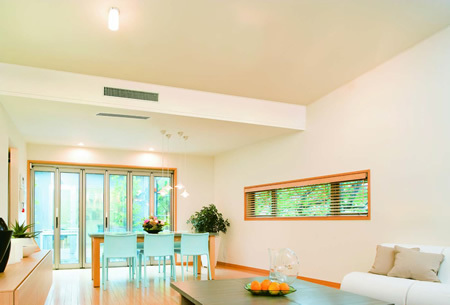 Here at AirMaster, we supply a range of different types of home ventilation systems in New Zealand through Smartvent, Avon (Clean Air), Mitsubishi (Lossnay) and Smooth Air (HEX390). Each carries different types and models such as positive pressure and balanced pressure ventilation and heat transfer in impressively sophisticated systems. These systems give a range of control over the humidity and quality of the air in your home, all done through intuitive control systems. There are also compact systems which punch above their weight, delivering high performance for minimum energy use. There is also a range of equipment for those who require parts as opposed to the whole system, but unless you have some expertise, it is recommended that you turn to professionals when installing or fixing home ventilation systems. Unfortunately, we live in a time when you can’t just keep your door open or crack open a window to have good air circulating through your home. Whether it be for security or pollution issues, sometimes you need more than traditional ventilation methods. Phil Twyford, Minister of Housing and Urban Development, has claimed that “all New Zealanders deserve to have a secure and healthy home” and in the rush to build these homes we have to make sure that not only are they well-built and reasonably priced, they have to be healthy and pleasant to live in too.